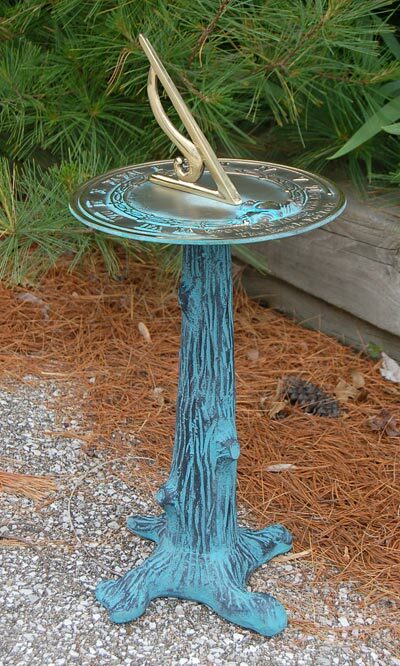 Showcase you appreciation of nature using the Rome Grow Old With Me Sundial and Cast Iron Tree Pedestal. The bold colors of each piece lend wonderful contrast to your garden, and this kit makes a great gift for any nature lover. The classic motif and lines on the Rome Brass Grow Old With Me Sundial add style to any garden niche, thanks to its verdigris background and brass gnomon, Roman numerals, and claddagh accent. This dial attaches to the Rome Cast Iron Tree Sundial Pedestal via is threaded bottom port, for a cohesive and bold accent. The textured finish and slight knots throughout this 16" tall stand mimic a tree trunk, while its verdigris hue meshes with the dial. The pedestal nestles perfectly within your flowerbed, and its four feet ensure stability on a level surface. Its hardy, cast iron construction is perfect for use season after season, and the brass sundial remains lovely throughout the years as well. Add a timeless adornment to your landscaping with this Grow Old With Me Sundial and Cast Iron Tree Pedestal. Rome Brass Grow Old With Me Sundial, Verdigris, 10" dia.